Complete standalone blue ray duplicator support BDXL no PC required to operate the duplicator. 128 MB DDR3 memory buffer that is 4X faster than competing models using SDRAM support copy of disc to disc one to one, CD and DVD backed by Copystars 3 years labor and 1 years parts warranty. Support BDR, BDRE, Mdisc, DVD-R, DVD+R, mini DVD, data CD, audio CD, VCD, DVDRW, dual layer DVD,CDR, CDRW. Support BD-R, BD-RE, BD-R DL, BE-RE DL, DVD-R, DVD-RW, DVD+R, DVD+RW, DVD+R double layer, DVD-R dual layer, mini DVD-R, CD-DA, video CD, photo CD (single & multi-session), CD-extra, CD-R, CD-RW, business card CD-R, 3 inch mini CD-R. Multi-language support: Language is displayed in: English, Spanish, Portuguese or Japanese. Advanced diagnosis mode troubleshoots and sets adjustment for optimal performance. Dual-level security-separate startup & setup passwords to prevent unauthorized usage. BDXL advantages: Burn large capacity triple/quad layer discs (100GB/128GB storage capacity. 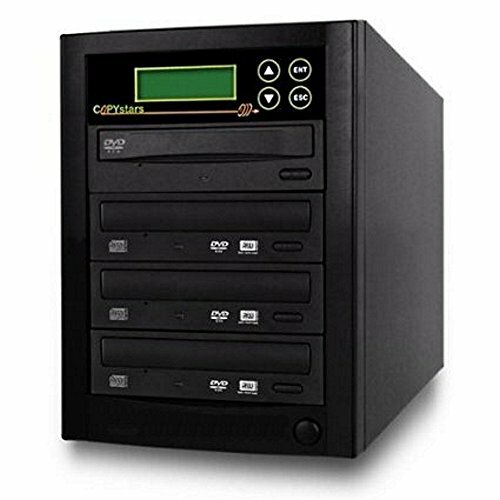 No PC required external blu ray burner duplicator, All Copystars blu ray DVD duplicator has UL. TUV approved power supply to ensure safety.